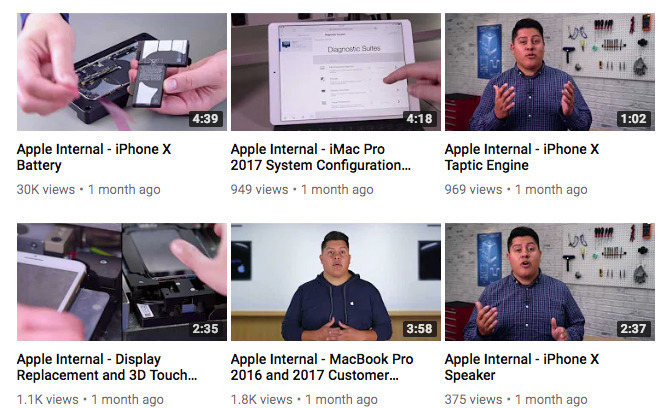 Uploaded to a channel owned by user "Arman Haji" approximately one month ago, the 11 videos are all named with the prefix "Apple Internal," and depict how Apple's service teams can make repairs to devices. All of the clips feature an instructor talking to the camera, explaining each step of Apple's repair procedures, including the use of tools normally only available to Apple Support and Apple Authorized Service Providers. AppleInsider can confirm the legitimacy of the videos on the account. The uploader claims the videos were initially leaked by another person via Twitter, reports Motherboard, and that they downloaded them "out of curiosity" before the leaker's account was shut down. "When his account got suspended, I wanted people to still see them," said the poster. "So I uploaded them to YouTube." The iPhone X features in the majority of the videos, alongside clips for the iMac Pro, MacBook Pro, and MacBook pro. The most popular video shows how to replace the iPhone X's battery, achieving over 30,000 views at the time of publication. Due to Apple's copyright over the videos, and the recent reporting of their existence, it is likely Apple will be taking steps for them to be removed from YouTube. It is also plausible the account holder could face further legal issues with the company, if Apple decides to take things further. Despite the rise of do-it-yourself repairs, such as those championed by iFixit and other firms, Apple is generally against users performing maintenance on their devices or taking them to unofficial repair ships, preferring instead for them to go through official repair channels. In some cases, repairs can result in unexpected issues that require more work on their devices, such as reports in April where iPhone users with aftermarket displays were found to have lost touch functionality on their devices.